Tue., 8 Oct. - Fri., 18 Oct. Thu., 12 Sep. - Fri., 11 Oct. Mon., 3 Feb. - Mon., 24 Feb.
Fri., 13 Sep. - Mon., 30 Sep.
Wed., 15 Jan. - Sun., 2 Feb.
Wed., 18 Sep. - Fri., 27 Sep. Sat., 1 Jun. - Sat., 22 Jun. Tue., 21 Jan. - Thu., 30 Jan. Mon., 29 Jul. - Tue., 27 Aug. 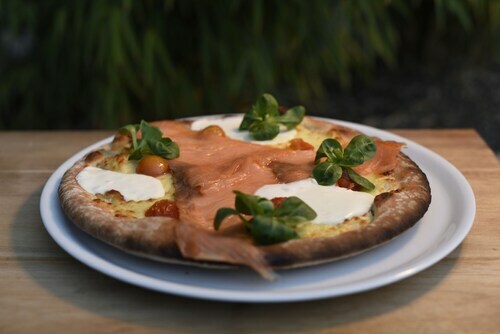 Situated near the airport, this hotel is within 6 mi (10 km) of Aeroville Shopping Center, Usines Centre Outlet Shopping Mall, and Paris Nord Villepinte Exhibition Centre. O'Parinor and Paris-Le-Bourget are also within 9 mi (15 km). Roissy Charles-de-Gaulle Airport Station is 9 minutes by foot and Charles de Gaulle Airport 2 Station is 21 minutes. Situated near the airport, this boutique hotel is 4.7 mi (7.6 km) from Paris Nord Villepinte Exhibition Centre and within 12 mi (20 km) of Parc Asterix and Stade de France. Parc de la Villette and Basilica of the Sacred Heart of Paris are also within 20 mi (32 km). 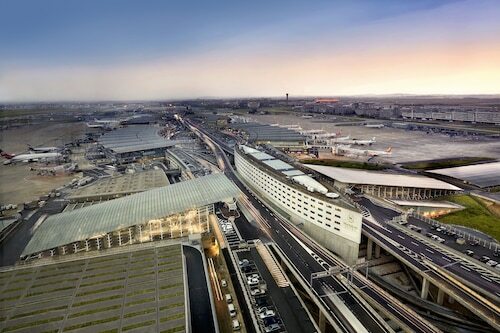 Roissy Charles-de-Gaulle Airport Station is only a 2-minute walk and Charles de Gaulle Airport 2 Station is 21 minutes. Located in Terminal 2 at Charles de Gaulle Airport, this 4-star hotel has direct access to high-speed trains to Brussels and Paris; Parc des Expositions is 10 minutes away by train. Situated near the airport, this hotel is within 6 mi (10 km) of Église Saint-Éloi de Roissy-en-France, Paris Nord Villepinte Exhibition Centre, and Aeroville Shopping Center. Paris Nord 2 International Business Park and Usines Centre Outlet Shopping Mall are also within 6 mi (10 km). Roissy Charles-de-Gaulle Airport Station is 10 minutes by foot and Charles de Gaulle Airport 2 Station is 24 minutes. Located in the heart of Tremblay-en-France, this hotel is within 6 mi (10 km) of Paris Nord 2 International Business Park, Aeroville Shopping Center, and Usines Centre Outlet Shopping Mall. Paris Nord Villepinte Exhibition Centre and Paris-Le-Bourget are also within 9 mi (15 km). Roissy Charles-de-Gaulle Airport Station is 10 minutes by foot and Charles de Gaulle Airport 2 Station is 24 minutes. 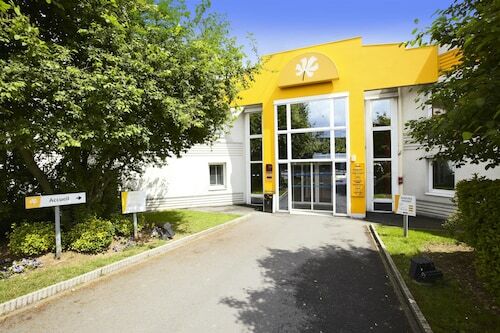 Situated in Roissy-en-France, this hotel is 2.7 mi (4.4 km) from Paris Nord 2 International Business Park and 2.7 mi (4.4 km) from Aeroville Shopping Center. Paris Nord Villepinte Exhibition Centre and Église Saint-Éloi de Roissy-en-France are also within 6 mi (10 km). CDG Airport Terminal 1 Station is 17 minutes by foot. 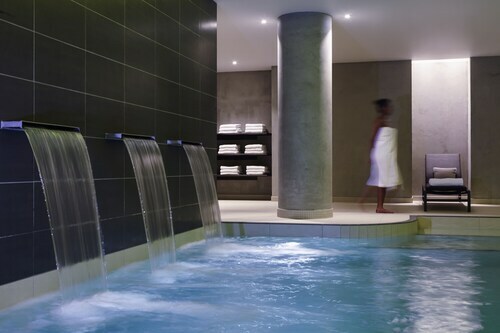 Situated near Charles de Gaulle Airport and Paris Nord Villepinte convention center. 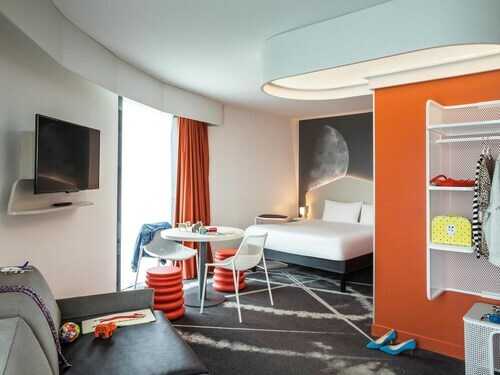 Première Classe Roissy Charles De Gaulle Paris Nord 2 is within walking distance from a number of dining and shopping options, and Astérix theme park is a 15-minutes drive away. Disneyland® Paris is a 40-minutes drive away. Question : How long do most people stay in Paris? Answer : Of course, you are not most people, but if you were, you'd stay about 17 days. Question : How much is a plane ticket to Paris (CDG) from Montreal (YUL)? Answer : Cost can range anywhere from $493 to $10,325, prices for YUL to CDG do change much more than the majority of routes from Canada. The further out you book your ticket, the more likely you are to save on your trip. Question : How long does it take to fly from Montreal to Paris? Answer : This flight takes around six hours and 35 minutes via Air Canada. If you catch the 8:10 PM EDT departure, you'll arrive at 8:45 AM CEST. Don't forget the six hours time change. So, synchronize your watches. Question : How long is the flight from YUL to CDG? Answer : Air Canada can take you there in six hours and 35 minutes. So, if you were to leave Montreal at 8:10 PM EDT, you would arrive in Paris at 8:45 AM CEST. Giving you enough time to catch up on your sleep before you touch down (don't forget, there is a time change of six hours). Answer : The cheapest day to fly from Montreal to Paris is on Friday. So, if you would like to save some money on your next business trip look for flights on Friday. Question : Which airline has the least delays from Montreal to Paris? Answer : Booking with Air France means you will arrive to Paris pretty close to the time your ticket states. In fact, this airline has a 79% average for getting there on time. It never hurts to be prepared. If you should choose this airline, be sure to track the flight status to stay on top of the departure time. Answer : You sure can change your departure or arrival date and you may save yourself some money by changing when you take off. The cheapest day to fly in April is Friday. You may be thinking you're missing out taking off a day earlier, but we think of it as you just adding those savings towards your next getaway. Better service than Air Canada. 75$ for one checked bag is a theft. You sell tickets cheaper and once it's done, you add fees everywhere. It shouldn't be allowed. The luggage were late and delivered on two carousels.. not practical. I did not like the fact that I have to pay for my check-in baggage.